The creamy chicken soup is a huge hit with my kids. It has all the vitamins of the vegetables added, but without the actual vegetables. What not to like about it? The soup is quite easy to make. You can use store bought noodles or you can make my homemade egg noodles recipe to whip up a delicious addition to the soup. I also use my Instant Pot to boil the chicken, in order to obtain a chicken soup. You do not have to do this and you can just boil the chicken old fashion way. As long as the chicken is cooked, that’s what you need. 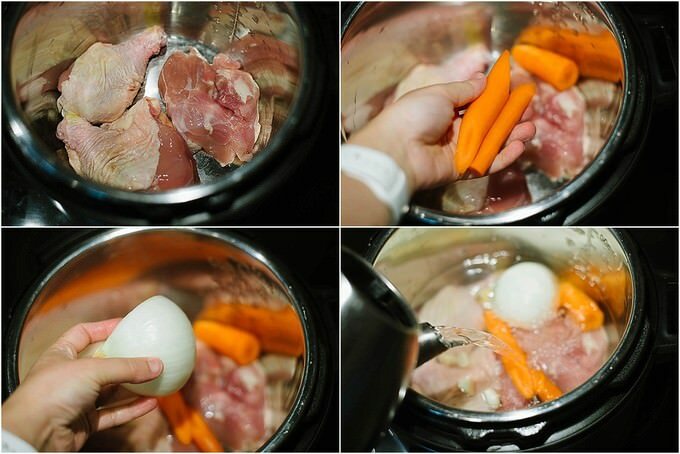 Place chicken, carrots, onion, garlic and water in a medium pot and bring it to boil. If you are using the conventional method of cooking, using the skimmer clean off the foam that builds up once the water starts to boil. Turn the heat down to MEDIUM LOW and let the chicken cook for about 30 minutes, or until tender. If you are using your pressure cooker or your instant pot for this step, place the above ingredients it in the cooker for 10 minutes and do a Quick Release once the time is up. Using a colander separate the chicken stock from under the chicken and vegetables into a different pot. Take out the chicken and shred it, discarding the skin of the chicken and the bones, if any are present. You can either toss the vegetables, or use the carrots as garnish. Add 2 tsp salt, 1/4 tsp black pepper, 1/2 tsp paprika and a bay leaf into the chicken stock. Bring the stock to a slight boil and add the shredded chicken. Turn the heat down to a simmer until your next step is ready. 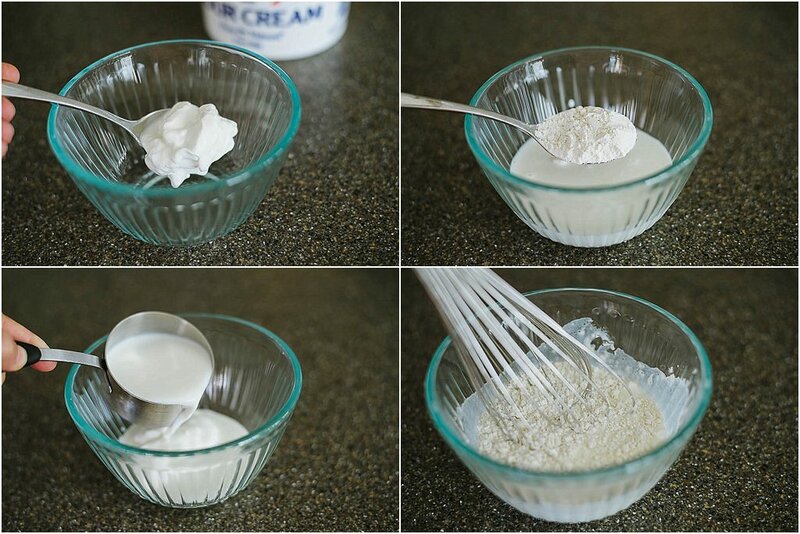 In a small bowl mix sour cream, milk, flour really well. There shouldn’t be any clumps formed. Add the dairy mixture into the soup and whisk it slightly until everything is well incorporated. Bring the heat up to MEDIUM and add the egg noodles. Mix the soup with a wooden spoon and let the noodles cook for about 5 minutes. FEEL free to add extra water if the soup is too thick for your taste. You should be able to dictate the consistency of the soup. That’s pretty much it! You can garnish the soup with anything that you like. in my case it is often either dill or cilantro. Add the dairy mixture into the soup and whisk it slightly until everything is well incorporated. Bring the heat up to MEDIUM and add the egg noodles. PLEASE ADD boiled water if the soup is getting very thick. 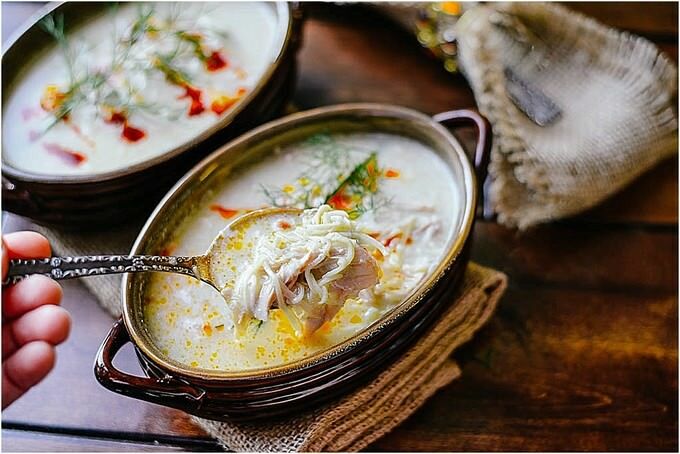 You should be able to control the desired consistency of the soup. 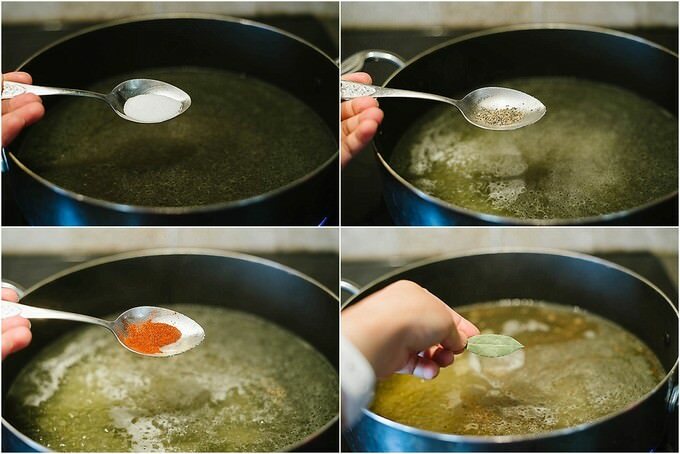 Mix the soup with a wooden spoon and let the noodles cook for about 5 minutes. That’s pretty much it! 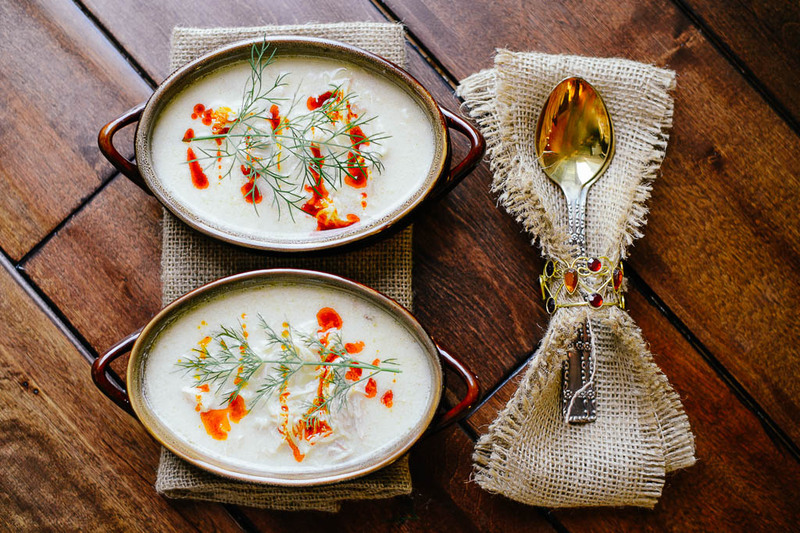 You can garnish the soup with anything that you like. in my case it is often either dill or cilantro. What vegetables can I add to the soup? And at what stage? Another question about the name arbuz. What does it mean? ? Hi Lana! There are some vegetables added in the beginning of the recipe. You can cut them up and serve, too. If you want to add some extra vegetables, it can really be anything that you like. I sometimes add potatoes (in the beginning with all the other veggies), celery and even broccoli. Broccoli is added towards the end though. Arbuz means watermelon :) Thanks for asking!